Throughout the city, cooks would setup a homespun shop serving up a modest, but warm meal. Their stands usually consisted of a grill in the middle of a large tray to cook the food, with an equally large pot to keep the food warm. However, large the equipment was, they were light enough to pack up at the end of the day and throw over the vendor’s shoulder. These men would wander the city looking for the ideal spot around markets, coffeehouses or popular meydanlar (public squares). Some would even set up low-standing stools for the convenience of their diners. There were two kinds of stands that served warm meals: those that cooked your food on the spot and those who prepared it beforehand. The dönerci (doner-maker) is a tasty example of the former. Much like today’s version, the dish in concept has changed very little. Slices of meat were stacked on a spit and cooked on a vertical rotisserie. While there are a myriad of dönercis and kebapçıs to choose from in the city, the Beşiktaş Karadeniz Dönerci is one of the most loves by Istanbul locals. As for the latter, some vendors offered nohutlu pilav (rice dish with chickpeas). Today, the dish is served from heated glass pushcarts and is a beloved item on the streets of Istanbul. Pilav today, as it was in the past, is extraordinarily versatile. In the Topkapı Palace, it was considered a luxury. When sold on the street whether it was in the 16th century or the 21st, pilav is humble and modest. With the addition of pulses, like chickpeas, it becomes a dish that is both filling and surprisingly economic; it was and is a dish for all. 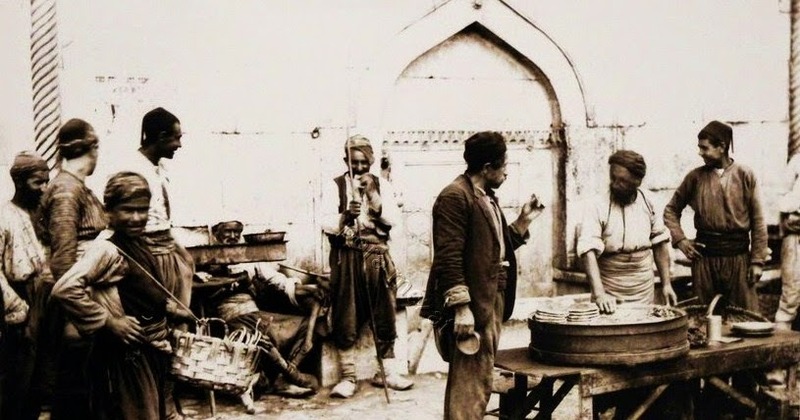 The street food of Ottoman Istanbul was not only for the working classes, though. Some garnered reputations that seemingly surpassed imperial standards. Nevşehirli İbrahim Paşa was elegant, eloquent and embellished. He also served as grand vizier to the equally fanciful Sultan Ahmed III. And, yet would send his servant, daily, to fetch pastries from a very specific vendor. Which pastry was he after? Unfortunately, record keepers were more intrigued by the act itself than the baked goods behind his motives. That said, it could be one of a couple of options. As Istanbul’s urban landscape was shifting during the late 17th century, bakeries started specializing in one or two items. Following in suite, vendors started offering specific goods like the çörek. It was a treat for anyone; although it was made with second grade flour (first grade was reserved for the imperial bakery), it was a lovely, soft-textured bread. The eggs and the little fat added to the dough made the bread a veritable luxury compared to those made from lowest grade flour – often described as “black.” This delicious çörek was served as a round bun and probably no larger than your fist. Anything larger would have been too pricy for a street vendor. After all, white flour was reserved for higher paying customers. Although it was served to all on the streets of Istanbul, it was a popular item during Easter in Greece and Armenia. Today, bakers braid the dough, similar to challah bread. While it still available, it is usually offered within the bakery. Because of its festive connotations, the bread is often referred to as paskalya çörek. Another option that our grand vizier could have been after was one that we all know well: the simit. The simit is a dense, ring-shaped, white bread dipped in pekmez (fruit molasses), coated in sesame seeds and baked. It is a wonderful treat to eat with cheese and tea or even on its own. But it was an even bigger treat during the Ottoman period because it was one of the few and first occasions that a working class people could afford bread made from the same grade flour that was used in the kitchens of mansions. Which also explains why Turkey’s simit is a ring. It would have been too expensive to make a loaf the size of the simit – far and few walking on those streets would have been able to afford that kind of bready good. While the simit is often compared to the North American bagel, the ring is in fact large enough to wear as a bracelet. Even if you’ve been in the country for less than hour, you’ve probably seen them. For an especially nice simit, head over to the Istanbul’s Tophane district and indulge at Tarihi Boğazkesen Simit Fırını. The lollipop has grown into a classic. 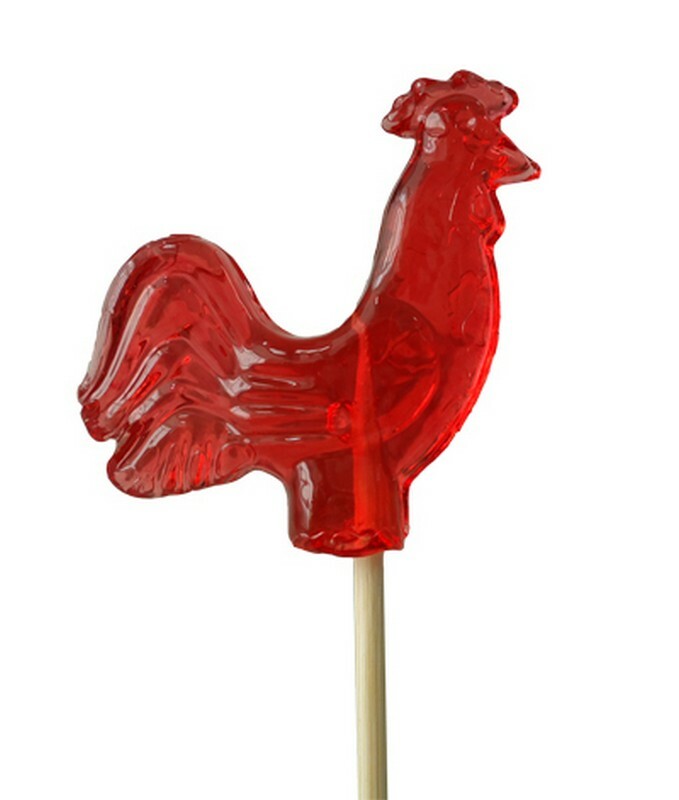 And, like many other traditions, Turkey boasts its own lollipop history: horoz şekeri or rooster candy. The Ottoman confectioners were keen on making animals from their sugar, which would have been seen in nearly all public festivals. And, it appears that the habit spilled over into the streets. 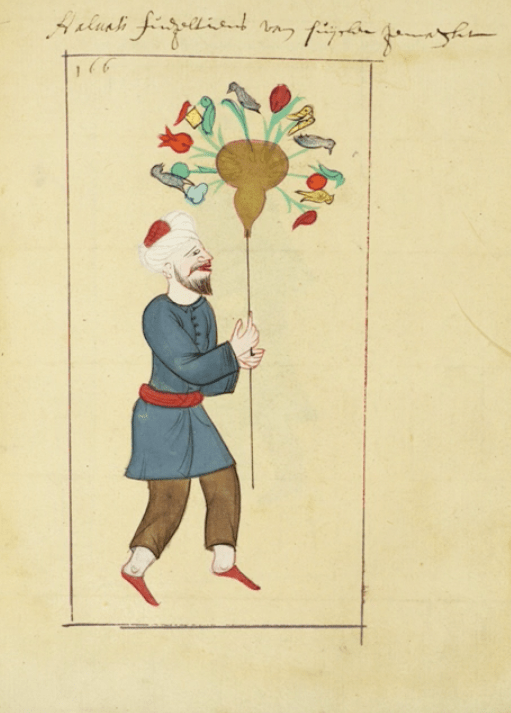 Ottoman Turkish writer Lâtifi described miniature sugar animals being sold on the streets of Istanbul in 1525. The candies were made from boiled sugar, often dyed, poured into molds and immediately poured out again. While the mold was cooling, the confection would put a stick inside. The mold is removed and the confectioner is left with a lovely animal-shaped sugary shell. It was the perfect treat. Not only was it sweet and playful, it was hollow and, thus, cheap enough to buy for your children. Today, these delicate hand-shaped candies are rarely seen. 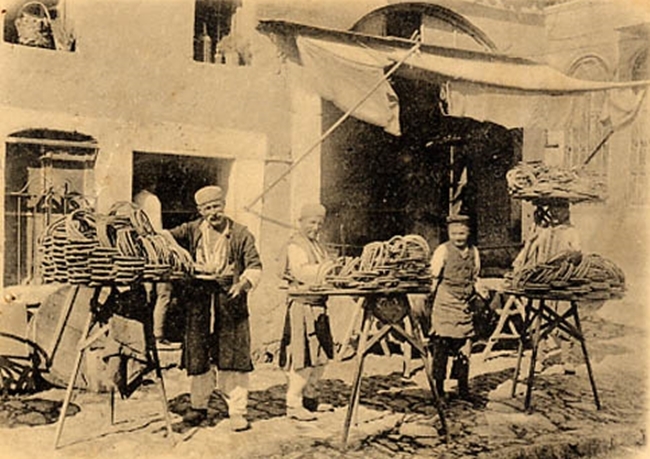 So rare, in fact, that only two şekerciler (confectioners) in the country still make them (one in Bergama, the other in Bursa). With the little demand, it is too expensive to sell them on the street. Every so often, however, you’ll be able to see children running around with them at wedding celebrations. While it’s possible you may not easily find these rooster sweets, if you have a craving for some hard candies don’t miss out on those at Istanbul’s most famous confectioner, Ali Muhiddin Hacı Bekir. Alongside with full meals and sweet snacks, Istanbul hosted a slew of vendor pouring out drinks. And, just like produce vendors, they, too, worked seasonally. Fortunately, we can still hear the call of these vendors through the streets of Istanbul, singing out their drinks. The bozacı was responsible for doling out portions of boza, a fermented wheat drink. Its slightly sour taste and thick texture was not only filling but it was to warm anyone on a cold winter’s night. One full glass would have been enough to last you through the night. Today, you can hear the signature call of the local boza vendor echo through residential streets during winter evenings. For a more contemporary version of this drink, listen for a bozacı singing down your street. Or, for a more certain result, head over to Vefa Bozacısı in one of the oldest districts of the city. 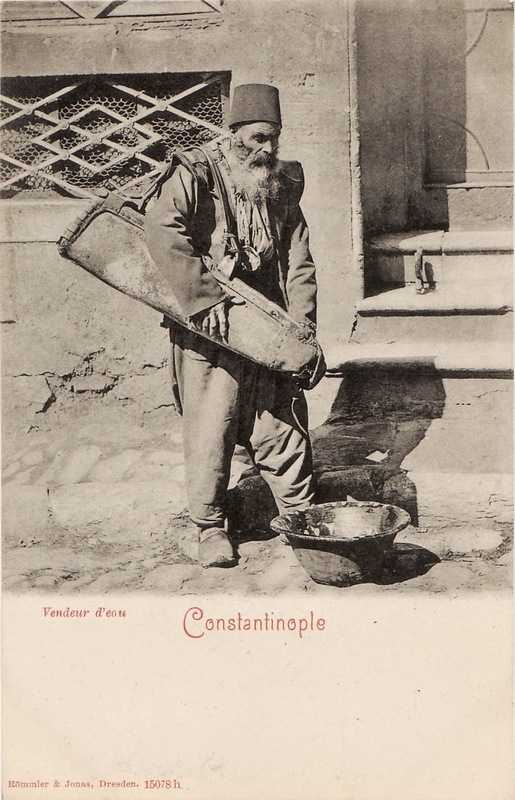 One character who has disappeared from Istanbul’s cast is the saka, the water vendor. It was the saka’s duty to fill a water-skin from the newly installed fountains. Not only was this a new convenience for Istanbul locals but it was also a solution to a dilemma. According to 16th century Ottoman traveler Evliya Çelebi, there were close to 1000 fountains in Istanbul. While that may seem like a big number, distance, disability, and simple obstructions were large deterred for some people. Women especially would have faced challenges commuting to and from the fountain. The saka eliminated these problems every day. Perhaps the role of the saka is still alive. Except, today, he doesn’t bring us water from a fountain in a 45-litre water hold, but rather he arrives on a motorbike with a 20-litre plastic bottle of water.